April 1976 issue featuring Mexican vampire cover and tribute to Bela Lugosi. Cover shows minor handling but is still near mint. 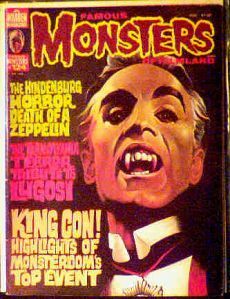 This issue also features coverage of the 1975 Monstercon. The first Famous Monsters convention was in 1974, and these gatherings have been very popular with fans and collectors alike. Website design and hosting by Sohodojo Business Services. Item 114 of 466 items displayed in viewer. 0 items in cart.